I am so excited to share my new Felicity Life Note Cards with you! I’ve wanted to do something fun and interesting with the many photos in my blog posts. I wasn’t quite sure what that would be until I came upon a website, Artifact Uprising, and decided to turn my lovelies into note cards. To say I am delighted is an understatement! The options are endless. I could give them as gifts or sell them. I could create postcards and give them away as gifts or sell them. Hmmm, maybe I could sell them? What do you think? I love, love, love the result. They look so professional and if I do say so, quite pretty! Some of the cards almost look like a water color picture. These little flowers appeared among the ferns (I described them in my post, Fernish Connections) in one of my garden beds. I think they may be an iris flower. Look closer and you might see what looks like two eyes, ears and mouth! And they seem to be flying, don’t they? Recently, I was telling my friend Joan, an accomplished photographer, about this fixation and she told me I am smitten with “macrophotography” – extreme close-up photographs, usually of very small subjects, in which the size of the subject in the photograph is greater than life size (though macrophotography technically refers to the art of making very large photographs). Who knew? I just like to get up close and personal with nature, food, fabrics and anything that catches my eye. After all, in my opinion the smallest details matter so much and provide a different and interesting view of life. Life is so full of the “hey look at me” things that require our attention. This world is so big and often overwhelming. And very distracting. When I take a moment to pause and focus on the beautiful, very quiet details of life, I find myself living the Felicity Life. I am consciously working on this everyday. I hope you take time to create more Felicity Life moments in your life! And capture them in photos. You too can create something to gift or sell! What a great discovery! When/where can I buy them (seriously)??!! I love how you look at things and the words that you use to describe your new insights. Really enjoying your blog and pictures. They both give me new perspectives into the “Felicity Life”. Deb, I am in the process of making them available on Etsy.com. Stay tuned! Thanks for the continued support and encouragement. I love it! I love the idea of making my photos into cards! It makes a special occasion greeting or thank you note just that much more personal. It is so easy – artifact uprising – http://www.artifactuprising.com – does high quality work. The note cards have the most luscious feel! Sandra, these look beautiful. It’s amazing how many photos you have taken since starting your blog. Making them into notecards is a brilliant idea. Hi Ginny, thank you! It is great to know that others like these little note cards! Great idea! You should start a etsy shop which will go on your blog. Thanks, Maria, I appreciate that you like the cards and think they would make a “go” on Etsy – I am now working on setting it up. I am also thinking about other themes like desert flowers, textured elements, etc. I am excited about the possibilities! Thank you for appreciating the flower photos! Like you, I cannot get enough photos and the closer I can get with my smartphone camera the happier I am! Aren’t we lucky to have four seasons of flowers and plants?! Everyday I find there is something new to discover and see! This post is beautiful and your photographs are amazing. I've always admired nature photography and love the fact that you take close-ups of all your "subjects." I'd also really like to see if I do have a green thumb and start planting my own garden (one of these days!). Thank you for stopping by so I could pop in and see your home 🙂 Hope you have a wonderful weekend! 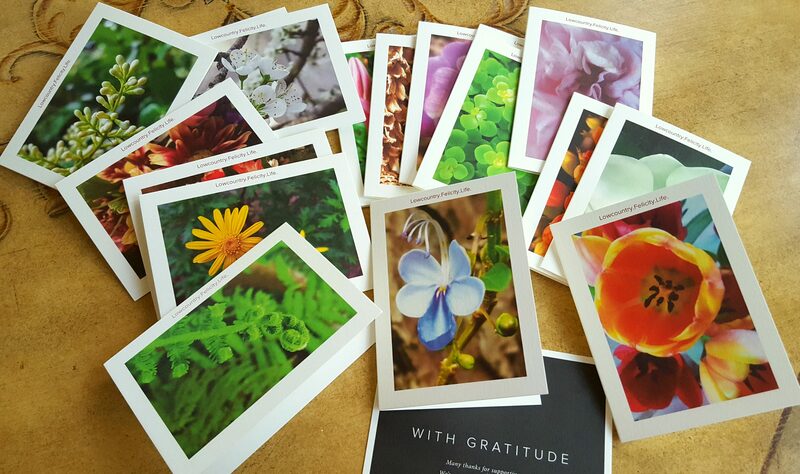 The note cards do look nice, and a wonderful outlet to share all those beautiful photos. Thank you! I am afraid I am now fixated on these little cards and how I can make more!